Chocolate graham crackers recipe for a fun homemade treat, a snack, or a scoop for cheesecake dip. This post has been sponsored by Rodelle Kitchen; all content, thoughts & opinions are my own. I will never forget the time one of Camille’s teachers from daycare pulled me aside and said Camille has a jealousy issue. When Camille was about 10 months old, I began dropping Camille off at a small ‘mom’s day out’ program a few hours each week. We were required to fill out a form each day. A section on the form inquired about the type of snacks she was allowed to have. I always said ‘snacks from home only’ because I packed plenty of snacks for her each day. What I didn’t know was that during snack time, the other kids were eating Cheerios and store-bought graham crackers. Apparently, my little Camille was jealous and kept reaching for them. After she was directed towards her snack from home, she snatched the graham crackers from the other kids. I took it as a sign that homemade graham crackers needed to happen. We love that recipe and make it about once a month in our house. We recently moved into a neighborhood that celebrates nearly every weekend with s’mores parties. So now, my pantry must always be stocked with graham crackers, marshmallow and peanut butter cups (side note: if you haven’t switched from chocolate bars to peanut butter cups in your s’mores, this is your year!). We have fire pits sprinkled throughout the neighborhood, and if the weather is nice on Friday, we all head out to make s’mores. I’d say about half the time my grahams are homemade, and half of the time they are store-bought. When I make graham crackers from scratch, the s’mores are incredible. Homemade grahams are a bit thicker (yet still crisp) and taste more like a cookie than the store-bought ones. I’d rather have a cookie base than a cracker base for my s’mores, ya know what I mean? 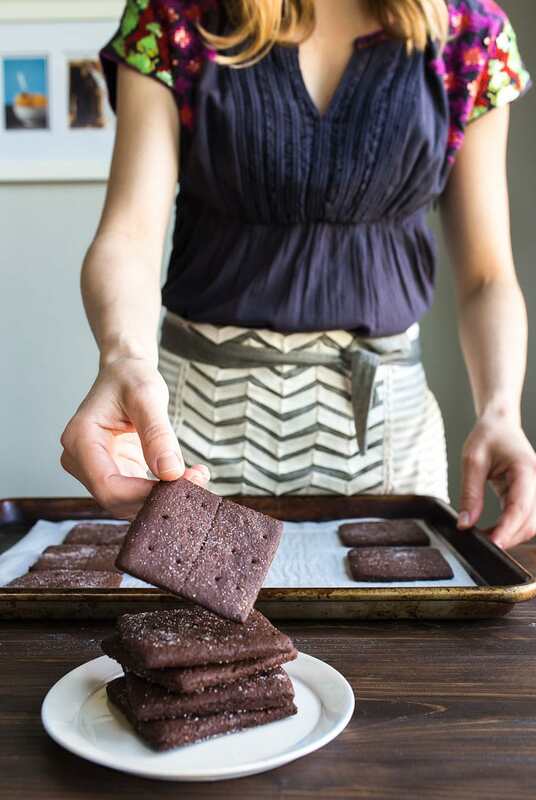 When I received a reader request for a homemade chocolate graham crackers recipe (hi, Lily! ), I immediately thought of how amazing a double chocolate s’mores would be! What’s the difference between Dutch Process and Natural Cocoa Powder? Dutch processed cocoa powder has been treated with an alkalinizing agent to neutralize the acidity of the cocoa powder. It’s pH is near 7, while natural cocoa powder is between 5 and 6. The lower the number, the more acidity. What makes Dutch chocolate different? It typically has a more mellow or smooth flavor. It tastes darker and richer, too. Often, it has a darker color. Recipes that use Dutch cocoa powder are often leavened by baking powder, which has a neutral pH. Can you use regular cocoa powder instead of Dutch processed? In a word, no. It really depends on the recipe. 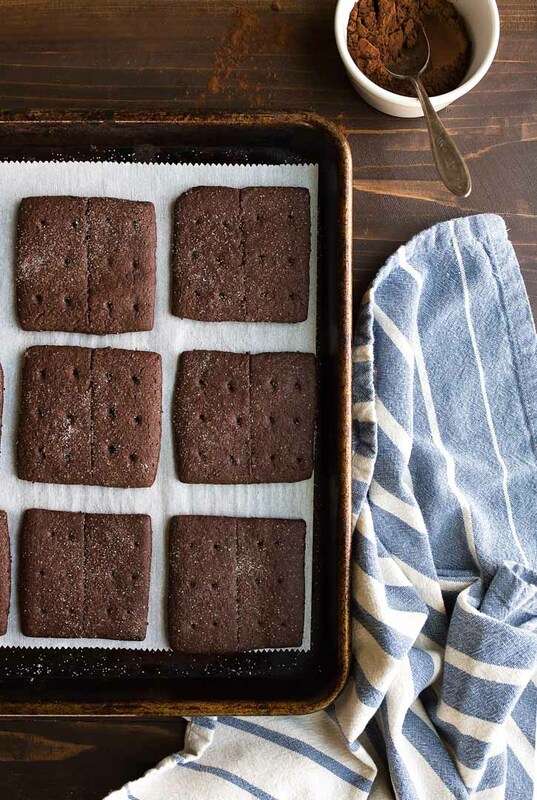 When a recipe uses leaveners like baking soda, you should use regular cocoa powder, unless the recipe states otherwise, like this chocolate graham crackers recipe does! 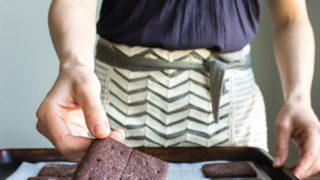 If you want to make a swap and the recipe doesn’t mention it, you can use Dutch processed cocoa powder anytime a recipe doesn’t need leaveners. I use Dutch processed cocoa powder when I’m making chocolate frosting or chocolate glazes, for example. I like the rich, dark flavor Dutch process cocoa provides in frostings. If you’re making a cake that calls for baking soda and you substitute Dutch-process cocoa powder, the cake will not rise properly. The Dutch processed cocoa powder has a lower acidity and will not react with the baking soda properly to make the cake rise. By and large, if a recipe calls for cocoa powder, it means regular. It will nearly always specify Dutch processed if you need it. 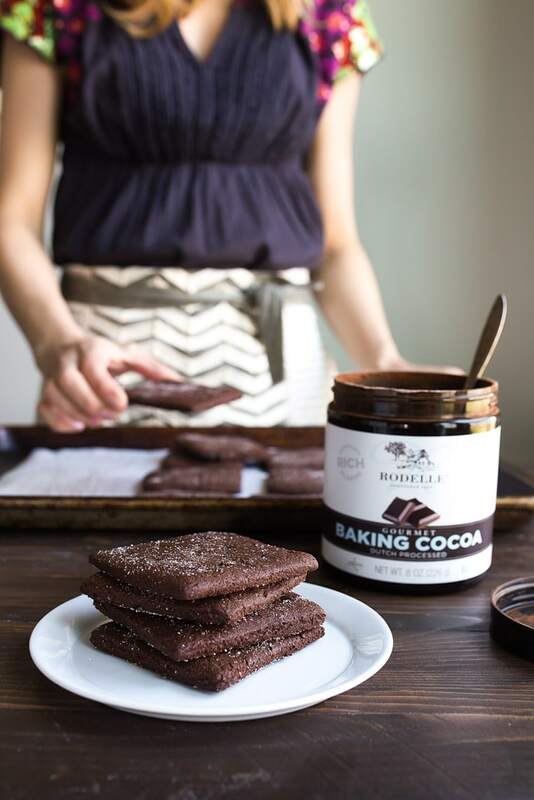 For this recipe, you may use either, but I highly recommend the Rodelle Dutch process cocoa powder because of the rich, mellow, smooth flavor. 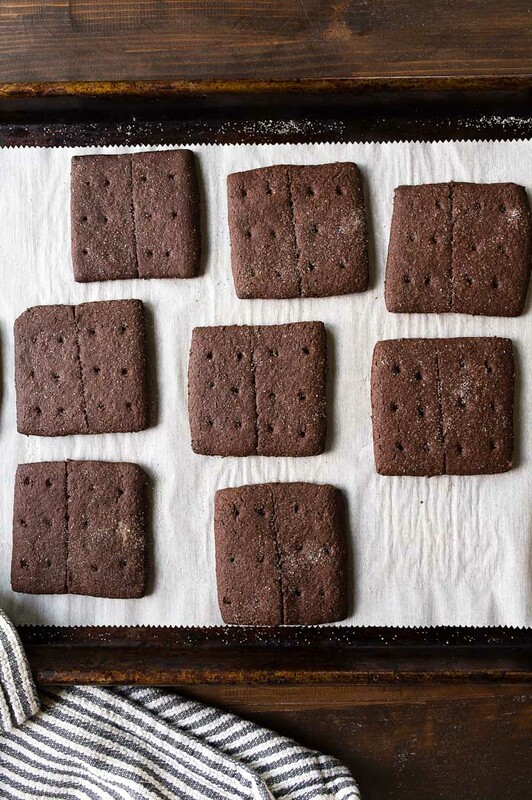 What can I use this chocolate graham crackers recipe for? 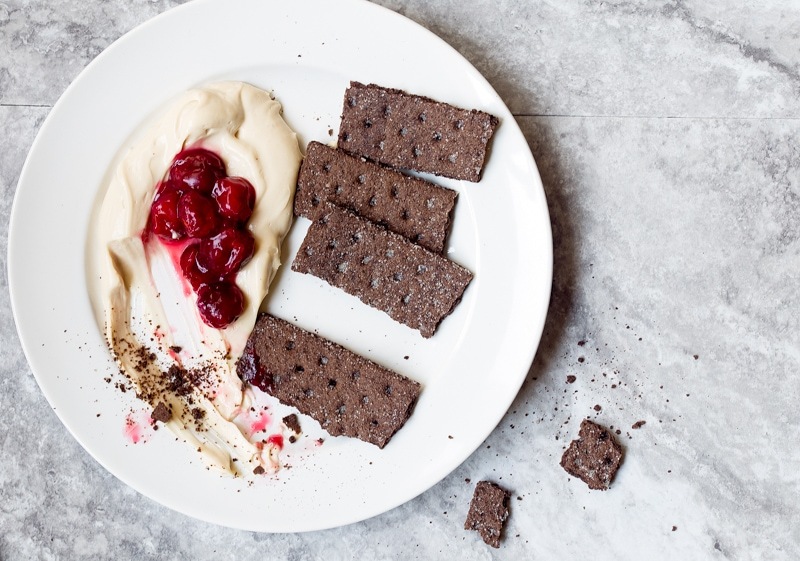 These homemade chocolate graham crackers are amazing with my cherry cheesecake dip. Actually, the first time I made that recipe, Camille was only 14 months old, and her eyes lit up when she saw the graham crackers. She snatched one off the counter, and I let her have it. Little did I know, that she had been wanting graham crackers for a few months and she finally got her little hands on one! Beyond that, they’re great for snacking, s’mores, or grinding up to use as a pie crust, or rolling my cherry cheesecake cookies in. Let me know if you have any more questions about Dutch processed cocoa powder below. I’m here for you! 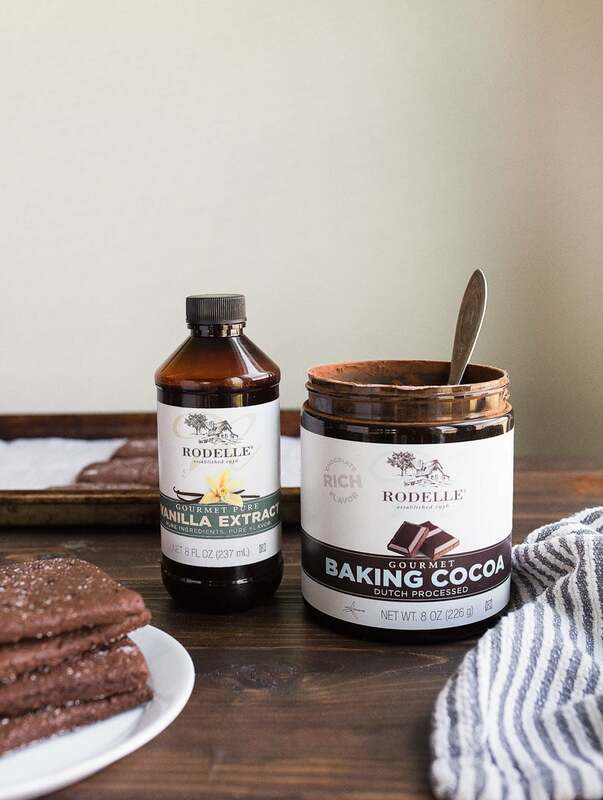 Thanks so much to Rodelle for sponsoring this post, and letting us all dive more into the wonderful world of chocolate together. Preheat the oven to 350, and line a sheet pan with parchment paper. In the bowl of a food processor, combine the flours, cocoa powder, coconut sugar, salt, and baking soda. Pulse a few times to combine. Add the diced butter, and pulse until a coarse meal forms, about 10 1-second pulses. Next, combine the honey, water, molasses and vanilla extract in a measuring cup with spout. Stream the liquid into the food processor while its running (use the feed tube). Roll out one-third of the dough at a time between two pieces of wax paper. Roll it until it's slightly less than 1/4" thick. Use a square cookie cutter (or any other cookie cutter shapes you like) to cut out shapes. Peel the dough away from all the cut-outs, and then use a sharp metal spatula to gently move them to the prepared baking sheet. (Removing all the dough around the crackers first helps you pick them up with the spatula without mangling them too badly). Watch the video for a guide on this. You will get about 27 graham cracker squares, or 14 whole graham cracker sheets from this recipe. Use a fork to prick holes all over, and the blade of a knife to score them in half (do not cut all the way through). First can I tell you that I was drawn to that beautiful shirt first and the graham crackers 2nd? I don’t blame Camille for reaching for graham crackers they are so delicious and snackable. I can’t wait to try them. I have no doubts that homemade ones are better than store bought. And using peanut butter cups instead of chocolate is a total game changer for me. Hi Christina! These look so good! I read through the post but just wanted to double check before I make the recipe – it will still work if I use regular cocoa powder? Thank you! These crackers would be amazing as a base for the instant pot cheesecake I am working on. I thought children under two were not allowed honey? Some people wait a little longer than is required, but it’s typically under 1 that you aren’t supposed to feed them honey. YUM!!! I love all the homemade treats you make for Camille! Is this recipe doable without a food processor? Can I substitute carob for the chocolate? I just made these with an all purpose gluten free flour blend and brown sugar instead of coconut sugar. They turned out great! Oh, Jackie! Thanks for letting us know that GF flour can be used! thank you! What can i use instead of coconut sugar? Greetings from Greece! Can you tell me about the gorgeous top you’re wearing in this post? Aww thanks so much, Kelly! It’s about 10 years old from Anthropologie; sorry, I know that’s not much help!